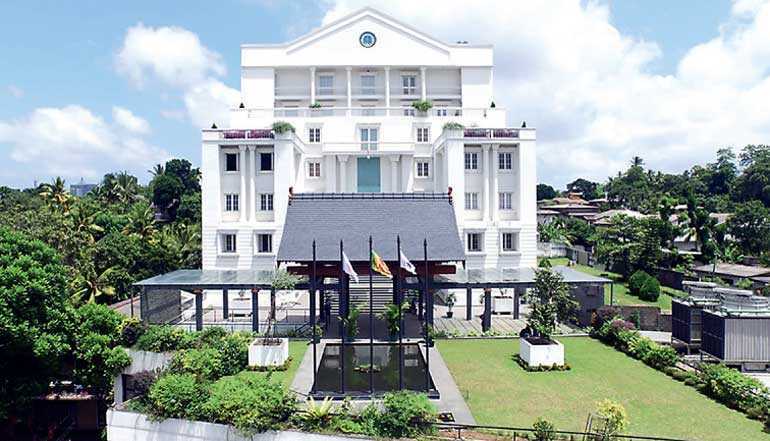 The grand Japanese-style building with three red letters KIU (www.kiu.lk) at the top, standing for Kaatsu International for Undergraduate Studies, located in Malabe, is a higher education institute accredited to the Ministry of Higher Education and recognised by the University Grants Commission of Sri Lanka. It currently offers several degree programs as well as diploma and certificate courses in Ayurveda, Acupuncture and Kaatsu at reasonable prices and with government interest-free loan schemes. Kaastu is a special method of body training invented in Japan by Prof. Sir Yoshiaki Sato, the Chancellor of KIU. A Bachelor of Science Honours Medical Science in KAATSU, Bachelor of Science Honours in Medical Science in Acupuncture, Bachelor of Science Honours in Nursing, Bachelor of Science Honours in Biomedical Science, Bachelor of Science Honours in Psychology, Bachelor of Management Honours in Human Resource, Bachelor of Management Honours in Marketing and Bachelor of Management Honours in Accounting are the other degrees on offer at KIU. Apart from all the facilities being designed to provide education and training to students, there is an acupuncture clinic offering free treatment to anyone not scared of needles. KIU also hosts under its roof the office of Green Cross, Sri Lanka, presided over by KIU Managing Director/Chief Executive Officer Dr. Jagath Seneviratne. In its commitment to the Green University Concept, KIU has undertaken many environmental projects in Sri Lanka related to water pollution, degradation of natural forests, the effects of the heavy use of polythene and recycling initiatives. While listing all the impressive facilities at KIU, one definitely cannot be left out - a beautifully designed, state-of-the art auditorium which can be rented out by external companies to stage events such as graduations, conferences and awards ceremonies, with the red carpet rolled out just like during the Oscars. With huge windows, lots of open spaces, natural light and a simple design, KIU ensures that all visitors are guaranteed to feel the calming influence of the building. Those who wish to experience this for themselves can visit 249/1 Malabe Road, Thalangama North, Battaramulla (tel. 0112741878).